Solas Nua's Chairman Paddy Meskell spent Irish Book Day 2014 giving away copies of What's the Story? at his local Metro Stop, Columbia Heights. In today's blog he'll share some of the highlights of his day spent sharing Irish literature with wonderful people from all around the world who have made D.C. their home. What a great privilege and joy it is to put a book into the hands of someone with the words “enjoy some lovely Irish stories and poems today”. Pat and Molly and Chris and Kate and myself gave out about 1,800 copies of What’s The Story? today. We wonder how many stories will “What’s The Story?” create as the book makes its way around the city and suburbs. Little Nellie from Peru stuffed her copy of What’s The Story? into her cute pink school bag and asked: “Is this really my own book”? Patricia from DC took one book and returned for six more because she is an English teacher in a local school and will use the book to teach her students. Baba from Dakar in Senegal put his copy beside a bunch of the red roses he was selling. “What’s The Story with The Red Roses?” we laughed together. Veronica from El Salvador took one book and then asked for a second because she said her husband needs to stop watching soccer and needs to start learning English. Anton from Jamaica flashed a smile that melted all the snow around us and wondered why the Irish can’t run as well as they can write. Sam a rapper from DC, is a cool, smooth lad who took out his buds long enough to take the book, flick through it and promise to write some rhythm for whatever his favorite poem in the book will be. Diana from Singapore studied in Galway and squealed with delight when she saw that the poet Sarah Clancy is also from Galway. I watched two lads with white hats on the Irving Street building site sit down for their lunch break. They had burgers and fries to eat and their recently acquired copy of What’s The Story? to read. Well, That’s The Story from Columbia Heights today. Dedicated, enthusiastic Solas Nua volunteers gave away thousands of books at metro locations today, so stories like these were repeated over and over and over. Thanks to Declan Meade at The Stinging Fly, to Dennis Houlihan of Solas Nua and to all our wonderful volunteers, supporters and financial contributors, who helped to make this magic happen. Written by Paddy Meskell On March 19, 2014 In Literature Tagged Irish Book Day, The Stinging Fly, Washington D.C.
Dennis Houlihan, President of Solas Nua and producer of Irish Book Day counts down to the event and gives us some insight into the process of creating and distributing What's the Story? “A Pot of Literary Gold for D.C. Commuters on St. Patrick’s Day.” This is how Ron Charles, Deputy Editor of the Washington Post Book Section, described our What's the Story? this morning in his blog. What a great way to start the final countdown for our 9th annual Irish Book Day. The tens of thousands of books we have given away over the years has sparked conversations across the city about Ireland past and present, about reading and writing, about arts old and new. The books have deepened personal connections to Ireland, brought back memories of trips, and inspired dreams of traveling to Ireland. Tomorrow (March 15th) we will gather at the Martin Luther King Jr. Memorial Library to put bookmarks in about 8,000 copies of What's the Story? Then they go on to the Irish Book Day truck, and then to you. 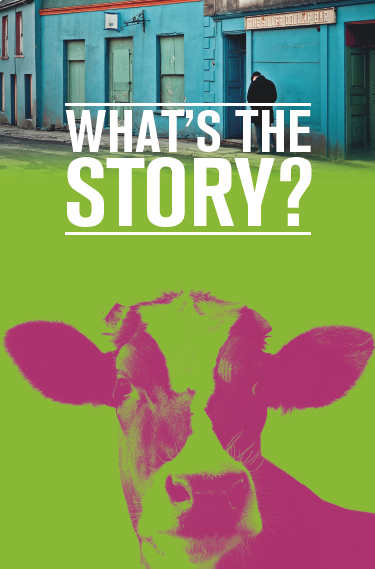 When you get your free copy on Monday, St. Patrick’s Day, whether it be on the street or from one of our storefront friends, tweet or post what you think on Facebook using #whatsthestory. We really want to know what’s the story. Dennis Houlihan presents What's the Story to Taoiseach Enda Kenney. This is the first time we have published our own book. We partnered with Declan Meade, editor of The Stinging Fly in Dublin, to develop a sampler of short stories and poetry. It will fit in your pocket or bag so you can read it on the bus, on the Metro, at lunch or before you turn in at night. By the time you finish What's the Story? you will have met thirteen new Irish authors. It doesn’t have to stop there, however. Join us at the Solas Nua Book Club on April 14th, 7 pm, Teaism - Penn Quarter, where the book-of-the-month is What's the Story? You join Solas Nua Book Club Facebook group too. Special thanks to the DC Commission on the Arts and Humanities for their generous support of Irish Book Day. What's the Story, Declan Meade? Irish Book Day 2014 is extra special because of our collaboration with Irish literary magazine The Stinging Fly to create the first original Irish Book Day publication. Declan Meade of The Stinging Fly gives us a little insight into the process of creating What's the Story? Declan Meade is the founding editor and publisher of The Stinging Fly magazine. In 2005 he set up The Stinging Fly Press. He has edited two anthologies of short stories for the imprint: These Are Our Lives (2006) and Let’s Be Alone Together (2008). He teaches a module on the business of publishing at the American College Dublin as part of their MFA in Creative Writing. Declan Meade and Kevin Barry. Photo by John Minihan. Tell us a bit about The Stinging Fly? The Stinging Fly is a literary magazine based in Dublin that publishes new writers and new writing. I set it up with a friend of mine back in the late 1990s. At the time I was trying to write short stories myself – and I was meeting a lot of writers who were just starting out and who complained of the fact it was really hard to get their work published. There weren’t many places publishing short stories, in particular. So my friend and I just thought that we’d give this a go. We put out a call for submissions and very quickly the stories and poems started coming in. There was enough good work to put together our first issue. I think the first issue was about 28 pages and we had five stories and about twenty poems. And the work is still coming in now sixteen years later. How did you get involved with Irish Book Day? I was lucky enough to have been invited to take part in the Solas Nua Writers Festival in 2011. I met Dennis Houlihan when I was in D.C. It was always the plan that we’d try to do something together again and Irish Book Day was really the perfect opportunity for us to collaborate. I love the idea of getting a free book. I also love any opportunity to discover new writers. That’s what Irish Book Day offers – that’s what it is all about. What were the criteria you had in mind when creating What’s the Story? I wanted to bring together in one volume some really good stories and poems that we have published in our different books and in recent issues of the magazine. Generally in deciding whether to publish a piece of writing, I will rely first and foremost on my gut reaction as a reader. If I’ve enjoyed reading a poem or story – if it has excited me, or thrilled me, if it has made me laugh or made me cry – I want to share that experience with other people. Of course, not everyone will respond to the work in the same way as I have. I hope that some people will though. With What’s The Story? as well, I wanted to offer a range of styles and approaches to the story and the poem. It’s a showcase for these different writers and their different work. Taken all together, I hope it will offer readers some fresh and interesting perspectives on Ireland and on Irishness now. Cover image. What's the Story? Tell us about the stories and poems you chose? We’ve published four single-author short story collections under The Stinging Fly imprint. There are stories from each of those books here. Kevin Barry is the writer readers are most likely to have heard of and read before. Since we published his first collection, he has gone on to get published in The New Yorker and in other US magazines and to win a number of prestigious international prizes. His books are now published in the US by Graywolf. ‘Atlantic City’ is the first story from Kevin’s first book – and I think it’s still one of his favorites. It’s a very funny story about a group of teenagers and then it switches and it becomes a very sad story. I still remember reading it for the first time and that is true of the other stories and the poems in What’s The Story? too. As a rule I tend not to say much about the work that I publish. I prefer to stand back and to let the readers decide. I think all these stories and poems deserve to be read and to be read widely – that is why I chose them for the book. I’m delighted that Irish Book Day is providing the opportunity for this work to reach a whole new group of readers. Reaching more readers, new readers – that’s something that will always make writers and publishers happy. Click to Support Irish Book Day!